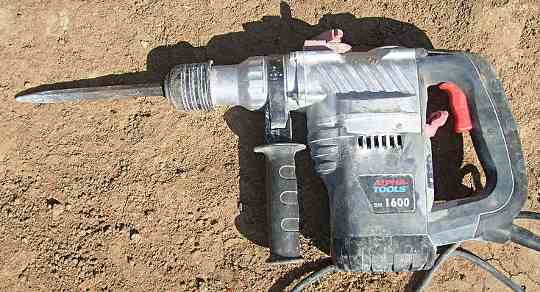 An electric tool for drilling larger holes in masonry and concrete. Many of them can also be used with a chisel tool. Also know as a masonry drill. 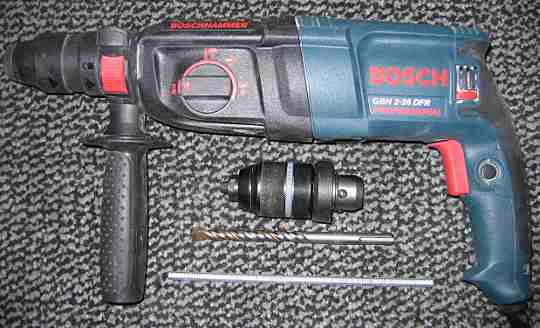 A drill bit and chuck system for hammer drill bits. Developed by Bosch. 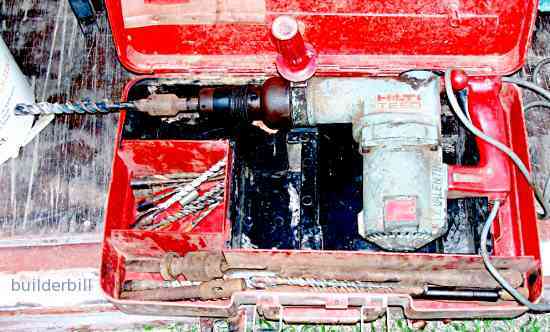 An old hammer drill that has done a lot of hard work over many years. The main reason for the long life of these type of tools is the fact that the gearbox sits in an oil bath, keeping it away from the inevitable dust that these machine generate. The machine can have the hammer action turned off, and it can also be used as a chipping hammer (hammer but no rotation), but it has no reverse. When the drill jams (for example against rebar in concrete) then drill can easily be lifted off the tool by the quick release clamp. Then the tool is backed out of the hole using a Stilson or multigrip type wrench. On this type of machine there is no speed control. The only option is the have the lever button switched to rotate for drilling and non-rotate for chipping. These old machines had a proprietary system of drill chuck and drill bits. At the time this HiIti was purchased they used to give very good deals on these drills, knowing that a contractor will be returning to buy their drill bits. Hence the reason for the adaptor on the bit in the drill. Quite simply we used to pay far too much for hilti bits so we bought adaptors to suit Kango type bits which were considerably cheaper. You can see a couple of other adaptors in the tray of the box. A more modern machine with a point chipper set in it. 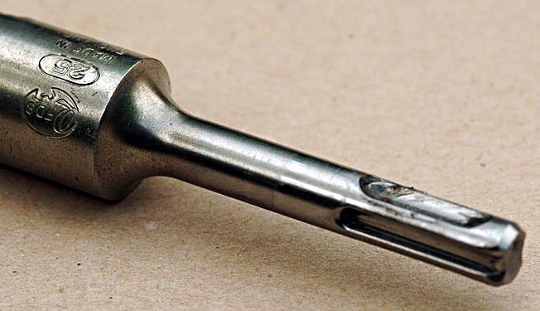 Here is a small hammer drill that is part of the modern trend to using standard fittings for these tools. Bosch pioneered the use of the SDS system which seems to be fairly well accepted now by many manufacturers. Quite often with these smaller drills the manufacturer will also add a three jaw chuck adaptor to make it possible to use ordinary smooth shank masonry drill bits. I know that Hilti are still hanging on using their system and anyone who is considering buying one of these drills for trade use should consider the availability and cost of these bits. They are consumables and they have a finite life. The bit above would be very expensive and as it looks to be over 30mm diameter it would be used in a larger rotary hanner drill than any shown on this page. The main feature of all the drill and chuck systems is the spring loaded quick insert and release feature. No chuck key needed. 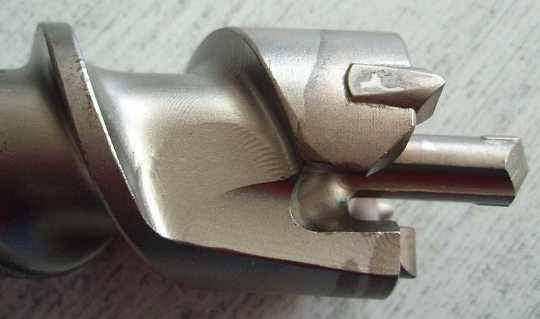 The design break through was getting away from a firmly clamped bit like in a three jaw chuck to a loose fitting and able to slide or bounce with the impacts.